Visit Cenova during your stay in Liguria, Italy. The museum „Museo del lapici“ is worth seeing in Cenova – this is the stone museum. You can learn something about stones there, and their creative art. You can undertake hiking tours through the magnificent natural vegetation in the area surrounding Cenova. Cenova is a small village in the Rezzo municipality. It was first mentioned in writing in the 13th century. In the medieval times Cenova got integrated into Imperia province and became part of the Rezzo municipality. In the 15th century a famous school for stone cutters was built, which met with nationwide approval. 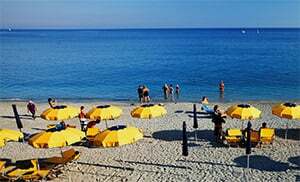 Cenova belongs to the Rezzo municipality and is a village in Imperia province which lies in the Liguria region. In the vicinity of Cenova are several other villages like: Rezzo (3.4 km), Lavina (4.8 km) and Muzio (8.3 km). From Genoa, take the Albenga highway exit in the direction of SS582 Colle di S.Bernardo. Then travel along the SS453 towards SP18 in Rezzo.